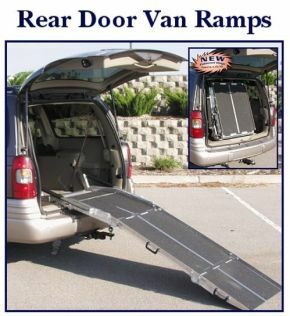 These telescopic wheelchair ramps for vans tick all the boxes. They’re made from aluminium, making them lightweight (and easy to transport) but durable and strong. They are surfaced with a high-traction/anti-slip tape that will provide reassurance and confidence when being used. And last but by no means least, they are an affordable solution! Supplied in three sections, the ramps are spring assisted and consequently easily constructed and operated by a single person. Designed specifically to be mounted on the floor of a van, they can be stored vertically when not in use. Available in both 7ft and 8ft length sizes, and able to support wheelchairs and scooters up to a weight of 272Kg (42 stone). This three section, manually operated van ramp, designed by PVI, is the solution for people needing a reliable, affordable van ramp. This ramp is designed to be mounted on the floor of the van. No assemble is required and it is easily installed. The ramp is constructed of aluminium and is spring assisted making the ramp easily operated by a single individual. There is high traction tape on the surface of the ramp. This ramp folds into three sections and stores vertically inside the van. The van ramp is ideal for loading both scooters and wheelchairs. The width of the ramp is 27 inches and it can be ordered in 7ft or 8ft lengths. The weight capacity is 600 lbs. / 272 kgs. Note: 813mm minimum inside door opening required for this ramp.